Revealing insight into the illusions at the heart of the Labour Party’s thinking about young people, education and employment. 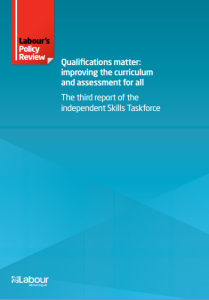 Labour has published Qualifications Matter, proposals for 14-19 education, as part of its Policy Review (www.yourbritain.org.uk/uploads/editor/files/Skills_Taskforce_3rd_report.pdf) . It’s going ahead with its support for a Tech-Bacc, something announced by Ed Miliband two years ago and designed for the ‘Forgotten 50%’ of school leavers who do not go to university. Under Labour’s proposals, all 14 year olds will have to follow courses in English and maths, undertake Personal Skills Development and an extended study or project, but will then follow either a technical (vocational) or general (academic) route to a National Baccalaureate qualification.